[Kyeongin] Shincheonji Church has grown quantitatively and qualitatively this year. Students who are enrolled at the Zion Christian Mission Center are learning the word. Shincheonji Church of Jesus, The Temple of the Tabernacle (Chairman, Man Hee Lee, Shincheonji church) is estimated that not only quantitative but also qualitative growth has been achieved which is significantly different compared to previous year. Shincheonji church produced the total of 20,027 graduates this year including Matthias tribe graduation ceremony which was held lastly in Dae Jeon Chung Cheong area on 23rd of December. In order to officially enter to Shincheonji church, 6 months of curriculum provided by the Zion Christian Mission Center which is free has to be completed. So, graduates mean a person who is officially admitted to the church. Starting with around 500 graduates in Europe on 13th of May, there were 545 graduates in LA on 3rd of June, 3,111 graduates from Peter tribe in Gwang Ju and Jeon Nam district on 24th of June and 694 graduates in South Africa on 12th of August who completed the curriculum. Also, 918 graduates from Thomas tribe in Jeon Buk district on 9th of September, 4,521 graduates from Andrew and Busan James in Busan, Ulsa, Gyeong Nam and Jeju district on30th of September were produced. 2,052 graduates from Thaddaeus tribe in Dae Gu Gyeong Buk district on 21st of October, 5,949 graduates from 5 tribes in the metropolitan area on 18th of November and 1,737 graduates from Matthias tribe on 23rd of December were released. 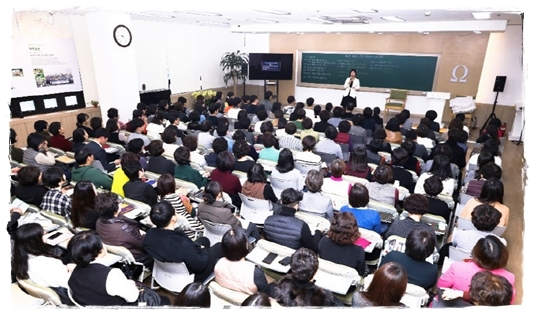 At present, there are total of 60,000 people are taking the Bible study course provided by Shincheonji church which includes 20,000 people in full time curriculum and 40,000 people in part time curriculum. In recent years, facing the number of Korean Christian is rapidly decreasing, the fact that 20,000 people join Shincheonji church is significantly meaningful by that number alone. Chairman Man Hee Lee, who has emphasized the fact that people should be recreated as a true believer through the Bible rather than being perfunctory, focused on cultivating the church members who is capable of teaching the word of God to others. Chairman Lee visited Shincheonji churches located in different district and asked a favor saying "For the construction of the kingdom of God, senior pastor should serve church members. All the church members should be active evangelizing for the constructing the kingdom of God. ".